2004; 726 pages. Genre : Mystery-Thriller. Overall Rating : B. A charred body is found in a house on Long Island. It appears to be a case of SHC (Spontaneous Human Combustion). None of the surroundings are burnt - just the victim, but he appears to have been fried from the inside out. Oh, and there's the small matter of a cloven hoof branded into the floorboard. After a second murder under similar circumstances, FBI agent Aloysius Pendergast and detective Vincent D'Agosta work to find a connection and a motive, and to see whether this is the work of natural or supernatural forces. Preston & Child have the thriller motif down pat; this is another good effort by them. There's lots of action, no slow spots, a bunch of threads to follow, and a couple red herrings to keep you on your toes. Pendergast and D'Agosta are a knock-off of Sherlock Holmes & Dr. Watson. Indeed, Brimstone reminds me of The Hound of The Baskervilles, with maybe a dash of "Wild Wild West" thrown in. At 720 pages, this could've been downsized a bit. And the characters seem a bit two-dimensional, although maybe that's just because I read this immediately after The Grapes Of Wrath. Finally, there was one short burst of preachiness in it - aimed at the Fundamentalists. And while I pretty much agree with the sermonette, it nevertheless seemed out-of-place and uncalled for in a mystery novel. 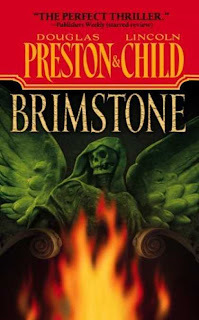 Brimstone is the fifth book in Preston & Child's Pendergast series. I've read #1, #5, and #8. Although they follow the same formula, there is still enough variance in the plots to where they don't become stale. And despite being the first book in a "trilogy within a series", this is a stand-alone story. I like that. It's much less aggravating than some series, such as Robert Jordan's The Dragon Reborn, where you work your way through a thousand pages, only to discover that nothing gets resolved. We'll give Brimstone a solid "B", and recommend it especially to Arthur Conan Doyle fans. Now see, I'm way too obsessive-compulsive to read series books out of sequence. There's always that saying that the book was better than the movie, but this review makes me wonder, how do thriller/crime novels compare to all the crime dramas on television right now (CSI, Law and Order, etc.)? Do people that like reading thriller/crime novels necessarily also enjoy crime drama television? I like the crime dramas on television, but in keeping with my snootiness toward genre fiction, I haven't read any thrillers or mysteries lately. CSI is probably more technical than Brimstone. IMO, a closer match would be Cold Case, where (in most cases), the key clue is some little off-hand comment or previously overlooked trinket. if you took Cold Case, then threw the supernatural into some, but not all of the episodes, you'd be close to the Pendergast series.